Time for the Austrian GP this is Red Bulls home track but the word is that it may not suit the RB12 lets wait and see, anyway I am hoping for some good points maybe a 5th & 6th place finish would be good. In other news Renault is planning a second in-season upgrade for around the time of the Japanese Grand Prix, as Red Bull expresses optimism the French car manufacturer can make some 'significant progress'. Come on Red Bull lets hope for a good race. Can't be worse than the last one. Hopefully it all comes together at RBR's home GP. It wont. Austria is for the mercs. Even though one of Ferrari's driver gets a 5 grid penalty, it's not looking good for Red Bull so far. Max Crashstappen in good form in FP1. Max Crashstappen & Lewis slam the @#$%& door shut Hamilton. 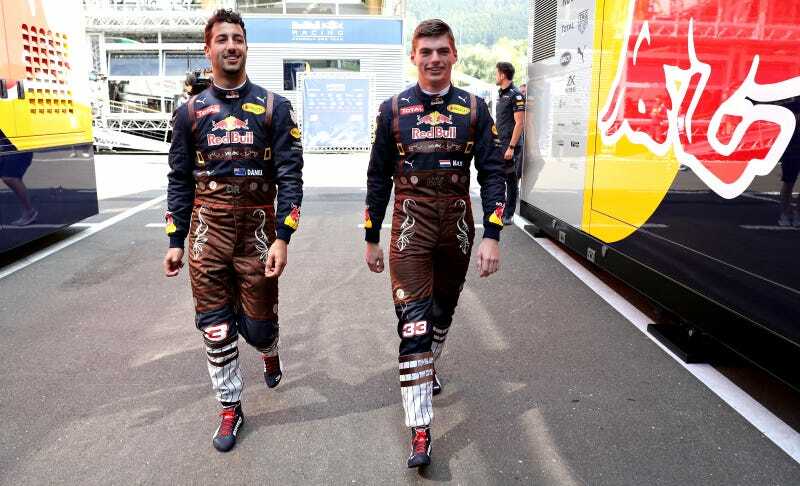 Why is ricciardo racing with @#$%& pace? Vestappen is all over him in the races. How the @#$%& did dan go from 4th to 7th by lap 4? This f1 is starti g to @#$%& me off. We have webber and vettel all over again ! Great result for Max with a P2. Disappointing result for Dan, although best Austrian result for RBR. Boxing gloves on for Lewis and Nico. What is going on with Ricciardo's race pace compared to Max??? As much as I dislike Mark, Daniel has gone all girly. Like WTF a Australian in Lederhosen? Good result for max but I agree duffer; it seems like mark and vetturd all over again. Hopefully early days and hopefully for dan there was genuine reason for the comparative lack of pace. Hopefully Dan gets his race pace back at the British Grand Prix. I think the wooden leg stump that Helmut had stitched into Dan's lederhosen racing suit would have severely restricted his movement in the car. No such limitation for Helmut's new favourite, Max Crashstappen, who had full leg movement in his suit, as can be clearly seen in Phatty's photo above. Dan should seriously consider a move to Ferrari and ensure that his contract strictly outlaws the wearing of fancy dress and pantomime costumes during race weekends. WTF One of Ricciardo's big strengths was he could make his tyres last, now all of a sudden Verstappen is making his tyres last longer than Ricciardo WTF has happened??? Edited 1 time(s). Last edit at 2016:07:05:12:21:47 by Whitey*~@.